As part of the climate and weather, wind is always blowing somewhere. It can be harnessed for energy. The force of the wind can be transformed into electricity, providing a reliable source of renewable energy - when the sun isn't shining. But development of wind power faces many challenges, least among them the size of required infrastructure. Poland, host of the upcoming COP24 climate conference, has long had a love affair with coal. Can it say goodbye and commit to renewables? While on a trade mission to the European Union, New Jersey's Democratic governor, Phil Murphy, has called for German industry to deepen ties with his state, especially in the energy sector. Preventing mining pollution in Brazil, wind power finally taking off in Lebanon, and harvesting water from volcanic steam in Kenya. We take a look at development, progress and innovation by looking closer at the elements. In Lebanon, power outages in some areas last for up to 12 hours a day. Now, the country's first wind farm is hoping to provide an extra 90 minutes of power supply nationwide, but the war in neighbouring Syria, the question of who actually owns the land and migrating birds flying through the area are posing more than a few difficulties. Danish energy group Orsted has officially opened the Walney Extension project, the biggest offshore wind farm in the world. The farm will cement Britain's role as the largest offshore wind market. Tamino Kifungu is a young innovator who wants to solve Tanzania's energy problem with renewables. 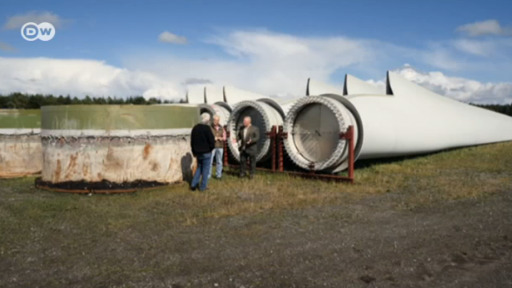 He is part of a group of self-taught engineers that are designing windmills generating electricity and pumping water. On this week's eco@africa, we meet a young Tanzanian innovator working to solve the country's energy problem with windmills, rescue food from the waste bin in Greece and help save the mangroves which save Libreville. Deforestation, light pollution, pesticides and wind turbines – German bats face threats left, right and center. To protect them, researchers need solid data on just how human activity is impacting their numbers. Russian businesses have been tasked with developing and building gas turbines in order to make up for lost imports. German engineers assess whether that is a realistic goal. The technology that made bitcoin possible could solve key challenges of a renewables-based energy system. The race is on to radically change how to we consume and generate power.